The name says it all…, Hidden Dunes in Destin Fl, rentals is a beachside gated beach resort along the sugar sand beaches of Northwest Florida is tucked away in our 27-acres of oak trees and towering beach dunes, and it’s fullname is Hidden Dunes Beach & Tennis Resort on Miramar Beach, FL just east of Destin. The resort provides plenty of space for relaxation as well as recreation, including court time at our top ranked Florida tennis resort. This quaint resort is the perfect home away from home and is located about a mile from popular shops and phenomenal area attractions. Miramar Beach is a scenic boulevard following the Gulf that entices its visitors to stop and take a deep breath of the fresh sea air. With an array of great beach activities. this resort is the perfect vacation resort for adventurers of any age or skill. The white sandy beaches and warm water beckon anyone interested in the relaxing and rejuvenating power of the ocean and sun. To top it off the amenities and location leave nothing unaccounted for! Wouldn’t it be nice to vacation somewhere where timeless moments with your family, sundrenched relaxation and glorious days at the beach just come naturally? This place encompasses the very essence of a natural beach vacation. It’s a place where hectic schedules and concrete jungles are simply not allowed, where you can get away from the things that bind you and create timeless traditions. At Hidden Dunes Beach & Tennis Resort, you’ll find time for the things you love and you’ll discover why this is the premier beach and tennis resort on the Emerald Coast. If this is not exactly what you’re looking for, we offer many other rentals in Destin. Holding the title of Destin’s first true tennis and beach resort is no easy feat. However, six championship clay courts framed by living windscreens and more private beach per unit than any other Destin area resort allows this great place to live up to its reputation. Tennis enthusiasts flock to Hidden Dunes year round to enjoy seasonal tennis activities, instructional programs taught by USPTA teaching staff and matchmaking services. 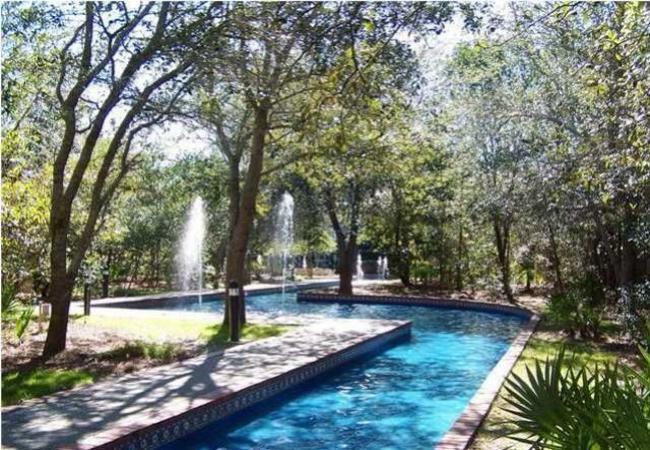 Plus 27-acres of lighted walking trails, a basketball court, four pools with hot tubs and full 24 hr. security makes it the perfect destination for a family vacation. Resting directly on the Gulf of Mexico means that nothing stands in the way of you and a sunny day on the sugar white shores of the Gulf. No crossing of busy streets or driving long distances. Also, its literally minutes from many delicious restaurants, antique and outdoor malls and championship Golf courses. You can finally vacation in an exceptionally private place surrounded by stunning natural beauty and great family entertainment. The resort, with reflecting pools and fountains, has its own private lake, 3 swimming pools (one heated off-season), hot tubs, 6 championship clay tennis courts, and a basketball court. For your convenience, a tram, which takes guests to and from the beach, travels throughout the resort during both spring break and summer. Hidden Dunes offers three types of properties including Beach Cottages, Villas, and Gulfside condos. Carolina-style Beach Cottages nestled in a naturally wooded landscape are enhanced by spacious and private screened porches, shaded walkways, reflecting pools, and flowing fountains. Daydream away a lazy morning on your shaded screened porch or take a short leisurely walk to the beach. One and two bedroom units are conveniently located on the ground floor with outside stairs leading up to larger units. Second floor units are uniquely designed with spiral staircase leading to a loft bedroom. Each non smoking cottage has a living room, master suite, fully equipped kitchen, dining area and washer/dryer. Savor life slowly by relaxing in spacious three and four bedroom Beach Villas. These units are so enjoyable you may forget about the beach which is just beyond our private lake. Certain units will have a view of the lake from wrap around screened porches. Indulge in the serene surroundings of the lake and watch the water fall from its flowing fountain. Roomy three bedroom units are on ground level with outside stairs leasing to upper level four bedroom units. Each non smoking Beach Villa has covered private parking, living room, dining area, fully equipped kitchen, master suite, wrap around screened porch and washer/dryer. The Gulfside condos is where you can relax around the Gulf front pool while you overlook the beautiful emerald waters and white sand speckled with tall palm trees and natural vegetation. Imagine sitting on your private Gulf front balcony peering through beautiful emerald green water. Each balcony in this 20-story tower faces the Gulf of Mexico. In each nonsmoking condo you will find a living room, dining area, fully equipped kitchen, master suite, guest bedrooms, and washer/dryer. Covered parking is also available in a two-level garage.